If you are located in North OKC and are searching for Couples Therapy and Marriage Counseling services please contact one of our offices today. We are here to help your relationship. Couples all over North Oklahoma City seek couples therapy to help them with their relationships. Despite what many people think, going to marriage counseling does not mean that your relationship is bad or that it is close to the end. On the contrary, making the decision to seek help for your relationship is a reaffirmation that it matters to you and that it is worth saving, both of which make it much more likely to happen. Our marriage counseling services in North OKC can help make your relationship stable, successful, and satisfying. Perhaps you are worried that you are not feeling the same spark as you once did as a couple and you are wondering exactly what or who changed. Perhaps one or both of you have had affairs and you are wondering if you can ever put what happened behind you. You might also be thinking about marriage counseling in anticipation of a change. It might be that one of you is returning to work, for example, or is dealing with an illness. We have seen hundreds of couples in couples therapy, married and otherwise, and we have heard a myriad of reasons for receiving help. At the root of them all, however, is the desire for a couple to stay together and to become stronger. If this is your goal, Marriage Solutions can help. It is important to check out the qualifications of your counselor or counselors. Good advice is good advice, but only a trained marriage counselor can help you realize long lasting transformation and results. Properly qualified marriage counselors will provide you with peace of mind. They are also more likely to have gained the relevant skills to improve your situation. They have a better chance of doing so more comprehensively and quicker than someone who is relying on good intentions. At Marriage Solutions, our team includes Licensed Marriage and Family Therapists (LMFT) and Licensed Professional Counselors (LPC) to ensure that you receive professional service that is approved at a high level. Marriage Solutions has helped thousands of couples save their relationship and move as a team into their future. 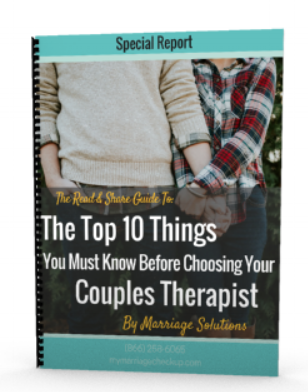 Whether you want to begin married life on the right foot, recover from an affair, prevent a divorce, or regain intimacy, know that none of this is new territory for Marriage Solutions. While we treat all of our clients on an individual basis, we also draw upon the wealth of our years of combined experience and expertise to give you the best quality service. By coming to Marriage Solutions, you are investing in your future as a couple. We do everything in our power to ensure that you leave us satisfied, prepared, and empowered. Our testimonials and reviews have helped many of our clients make the decision to seek couples therapy with us. Many of our clients from North OKC have been referred by other clients after we helped them get their relationships on track. It is natural for them to want their neighbors, friends, and family to share the same experience. Having your relationship working again after a bad period can be a relief. It can be life-changing. Many of our customers, therefore, are very vocal in their praise and in their testimonials. You do not have to take their word for it. Whatever you are looking for, if it involves repairing or strengthening the bond between you and your significant other, we have the experience, expertise, and focus to make this a reality. We will help you to improve your communication and your intimacy, and we will be with you every step of the way. To learn more about our North OKC marriage counseling services, please contact us today at 405-237-9697. With locations in Tulsa and OKC we also serve the Edmond, Moore, Norman, Yukon, North OKC and South OKC areas.